And it's Light4theLord here today, ready to give a few more secrets away on my newest project that was announced in the Looking Ahead post! Essentially, you're getting a promo photoshoot in here as well, so enjoy. Princess Jacquelyn Sophania Carales of the fair but torn land of Nuvoria. I have Miss Elizabeth here today for a few questions about her new role - and make sure to ask questions in the comments for the stopmotion interview! If you would like to become awesomer, you've come to the right place. If you would like to be as awesome as us, dream on. Mia here, Delaney there. I'm still learning how to be awesome. However, Delaney has plenty of AG store practice, and she showed the world her awesomeness here. Yeah, yeah, yeah. It was epic. This time? We doing it awesomely again. 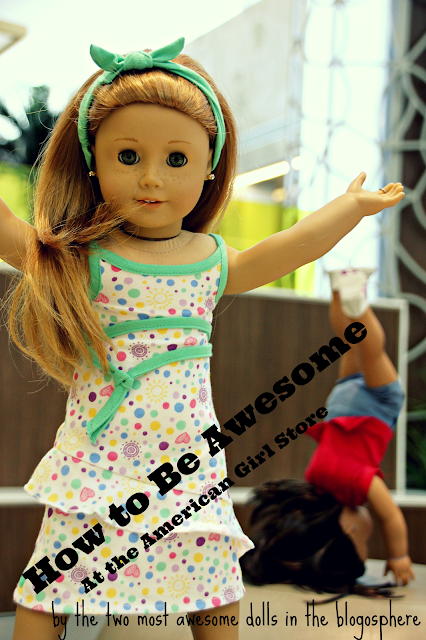 Ready for a step by step guide on how to be awesome? Nope. You're not ready. You'll never be ready until you read that WOW post. if you answered YES to the above question, you're wrong. If you answered NO to the above question, you're wrong. If you answered WELL DUH I DID to the above question, you're right. Keep reading. Step #1: Reserve a room under your guardian's credit card. What? She doesn't have a credit card?! You're joking! Oh. Right. I knew that. Anyways, put it on her tab. It's easy. Step #2: Order room service on your guardian's tab. All the time. I don't mean like every meal. I mean like, be so awesome that you're having like, all the hotel room service people running to your door. Excuse me? Miss Danger Clark? I believe this is your salt and pepper. Order salt. Order pepper - with ten minute increments. And then order your drink. Ahem. Danger, here's your drink. Can you stop soon? Then wait a few minutes and order dressing for your salad but don't order the salad until four workers have already served you. Step #3: Jump on the bed. This one is just plain awesome. It's also very fun, especially if you do it while the room service peeps are coming. I'd say do a backflip, but I'm not sure if you're epic enough. Step #1: Steal Tenney's guitar or pop all of her strings. Yeah, this one's pretty awesome. If you don't know how to play, all the better. Tenney has perfect pitch and she hates off-key music and absolutely abhors screechy and horrible guitar playing. Hey, and those strings cost like $20 bucks each, so all the more to you if... yeah. You think of it so that I don't get in trouble, okay? Step #2: Turn up the amp really loud and ruin all of the controls. It's not that we're not capable of doing this ourselves, it's just that Elly wanted to help. So we let her. Only because awesome people recruit others to join the awesome cause. Step #3: Steal the mic. Easy is as easy does. Just steal it and you've stolen the show. Step #4: Use a tambourine and shake it at really weird and off-beat times. Heh, this one's funny. Logan can't stand off-beat stuff. Wait, wait! What are you doing? Just stop, please! Step #1: Sit on the barre. Yeah, that little stick thingy. If you break it, all the better. Step #2: Dump water on her towel. That's just for extra effect. Step #3: 'Borrow' her bag. This also includes rummaging through it and dumping stuff everywhere. Super easy. But easy isn't everything, and awesome people don't go for just the easy stuff. Heyyyy! Come back with my scooter! Stop that camera! Ouch, ouch, ouch! That was my foot! Step #1: Borrow her scooter. Just wait until she gets off to go get something. No biggie. Step #2: Turn on her scooter camera. This is so you can record her reaction and post it on social media. Absolutely hysterical. Step #3: Run over her toes. Very fun and self-explanatory. That is, if you're awesome. Step #1: Order so much food that they get backordered. Use the same method as the room service. Order condiments, and then each food separately. Step #2: Spin on the chairs. A lot. Also very annoying for poor Maryellen. Step #3: Take up all the seats. This prevents other, less-awesome people from ruining your awesomeness. Alright. You're officially ready to go to the American Girl Store. Be awesome. Haha, I guess Del is rubbing off on Mia. Best bad influence ever! The worst part is that I think they've rubbed off on Paige. Yes, it will be a while before she goes to the AG store. This is a cute and funny post! Well, of course. Duh. Why should she wait? LET HER GO! And um, it's NOT cute. LOLOLOL!! Oh my gosh, this is AMAZING!! I laughed out loud SO hard! XDD L4TL -- I mean, Mia... XD -- YOU'RE' SO HILARIOUS. Del loved meeting and being awesome with you! AND I LOVED MEETING WITH L4TL AAAHHH! It. Was. Amazing. Delaney: SUP. MIA. YAY. AWESOME. Delaney:: That's Delaney DANGER Clark to you, missy. DELANEY! Fantastic job stealing that laptop. You know, you should just take it and hide it in a place where only dolls can fit. Then you can just keep it. Delaney: Thanks. I know. I should. That's really the reason why Madi hasn't been posting as much. BECAUSE I TAKE HER LAPTOP FROM HER. Boom. DELANEY YOU ARE SO AWESOME!!!!!!!!!!!!!!!!!!!!!!!!!!!!!!!!!!!!! Read other DNA posts here! Dolls N' All is a participant in the Amazon Services LLC Associates Program, an affiliate advertising program designed to provide a means for sites to earn advertising fees by advertising and linking to Amazon.com."